Share your experiences with Intruder 150? 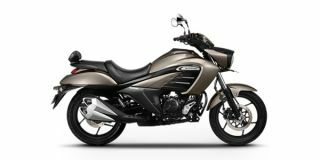 Suzuki has launched the new Intruder 150 SP and 150 FI SP at Rs 1.00,500 and Rs 1,07,500 (both, ex-showroom, Delhi). The SP variant gets a special matte black paint scheme with red accents and a pillion backrest as standard fitment. As the name suggests, its design is inspired from the larger Intruder cruiser bikes. The bike’s design is dominated by the front cowl housing the big headlamp unit flanked by fuel tank extensions. The rear gets a large dual-barrel exhaust and bulky rear cowl. The Intruder 150 shares the Gixxer’s engine, frame, suspension, brakes, wheels and tyres, but it’s been slightly modified to accommodate the cruiser styling. The front forks and rear monoshock have also been tweaked to suit the nature of the bike, and the swingarm is longer now.